If your are going to give up one of the iconic roles you are known for, then why not go out with your best performance. That is exactly what Hugh Jackman accomplishes in LOGAN. 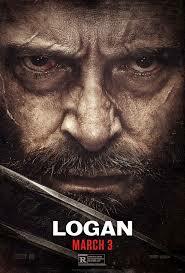 He has played Wolverine in 9 films. About time to retire the adamantium claws. The film is set in the not too distant future. Professor Xavier is losing his mind. Seems like it is dementia, but when you a mutant with powers like the Professors that is something that could end the world. So Logan is keeping him hidden and sedated somewhere across the border in Mexico. The mutant Caliban is his pseudo-nurse while Logan drive a limo. Then a nurse finds him and asks for help to get a child to some mutant hideaway in North Dakota. Logan refuses, but he is drawn in by circumstance and his kind heart. That’s when the movie really takes off. The child is part of an experiment that turns kids into mutants. Now they are being rounded up. Logan hits the road with Professor X and the child. Logan is both savior and mentor to the girl. The film feels like a modern western. The chase across dusty or remote vistas. The good versus evil. And it all works perfectly. Storylines are wrapped up, sequels are hinted at and fans get closure on Logan’s journey. If we will never see Wolverine again (at least with Jackman in the role), then this was a perfect send off.